The land of festivities, India is gearing up to host yet another celebration-- Hindu New Year. Just when the Sikh community observes Vaisakhi, Bengalis celebrate Pohela Boishakh, Malayali and Tuluvas are engrossed in the Vishu festivity, Assamese people are captivated in the celebration of Bohag Bihu. Yes, all of it officially marks the beginning of Hindu lunisolar year. This year, Bohag Bihu, also called Rongali Bihu falls on April 15, and there is already much excitement surrounded on the seven-day festivities. Bohag Bihu 2019 is the onset of Hindu Assamese New Year, that historically signifies the time of harvest. As the festivity is fast approaching, here is the history, 2019 festival date and significance associated with the celebration of Bohag Bihu or Rongali Bihu. Here's How The Harvest Festival Vaisakhi And Sikh New Year Is Celebrated In Punjab. Bihu is one of the most important festivals of Assam, which are celebrated with much enthusiasm in the state. Rongali Bihu is celebrated during the springtime, and is considered as the festival of merriment. It unites the people of Assam irrespective of their religions or backgrounds and promotes the celebration of diversity. The festivity is celebrated for straight seven days in the month of Vaisakh, or locally called as Bohag. Traditional Poila Baisakh Menu That You Must Try On Bengali New Year. The Assamese New Year usually falls on the 2nd week of April every year. Although the dates vary, it historically signifies the time of harvest. Rongali Bihu or Bohag Bihu 2019 is celebrated on April 15, and the festivity will continue till April 21 with much enthusiasm, traditional music and feasts. Bihu is the major festival in Assam, with people gathering together and indulge in the joyous celebrations. 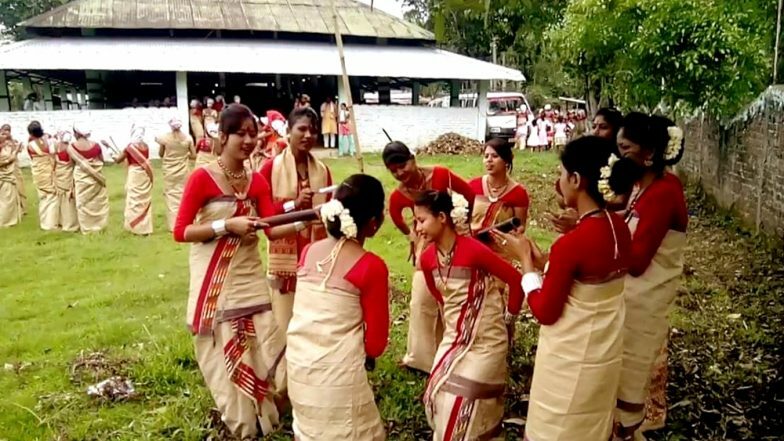 In Assam, Bihu refers to a set of three different festivals-- Rongali or Bohag Bihu observed in April, Kongali or Kati Bihu celebrated in October and Bhogali or Magh Bihu which takes place in January. The Rongali Bihu is considered to the most auspicious among the three, celebrating the Assamese New Year and the spring festival. During Rongali Bihu, there are seven pinnacle phases-- Chot, Kutum, Mela, Raati, Goru, Manuh, Chera. How to Prepare Vishu Kani, From Krishna Idol to Grains, the List of Items To Include. Raati Bihu celebrates the first night of the Hindu month of Chaitra. Local women gather in an open field, and light up the torches and men folks of the villages play an instrument called pepa which is made of buffalo hornpipe, during the occasion. Chot Bihu is also called Bali Husori, the phase of which begins on the second day of the month of Chot Mah. On this day, people indulge in traditional Bihu songs and dances, till the occurrence of Uruka, the formal beginning of Rongali Bihu. Goru Bihu is related to the agricultural roots of Assam. On the last date of Hindu Chot month or the day of Sankranti, the first day of Rongali Bihu is dedicated to carrying the upkeep of livestock and a cattle show. The collective cattle are brought to a water source such as a pond or a river, washed with a combination of symbolic herbs and recite traditional passages in Assamese, honouring its participation in the harvest. Manuh Bihu is the first day of the Vaisakh month, when people wear new clothes and seek blessings from the elders in a family. They also present each other the ceremonial patch of Gamusa cloth, which is to be worn as a symbol of cultural pride. Kutum Bihu is the second date of Vaisakh month, when people visit their families, relatives and friends and enjoy Assamese delicacies together. Mela Bihu is the third day, which is observed by the celebration of Bihu with cultural events and competitions in outdoor locales. People from all over Assam attend the fairs and aim at fostering an atmosphere of the communal brotherhood and the inclusion of everyone. Chera Bihu is the fourth day of Vaisakh month and final day of Rongali Bihu. In different regions of Assam, people observe it differently; however, the common theme is to conclude the celebrations with contemplation and future resolutions. Families exchange Pithas during the Bihu week and enjoy the blissful time of the year. Rongali Bihu is a part of the Bihu festivity in Assam which continues for seven days. Besides, all the traditional feasts and other features, Bihu dancing is the most popular which attracts a vast number of tourists. Now that you know the detail celebration of Bohag Bihu, enjoy the Assamese New Year with much fun and enthusiasm.